Giclee print of the original painting by Sonya Ki Tomlinson. 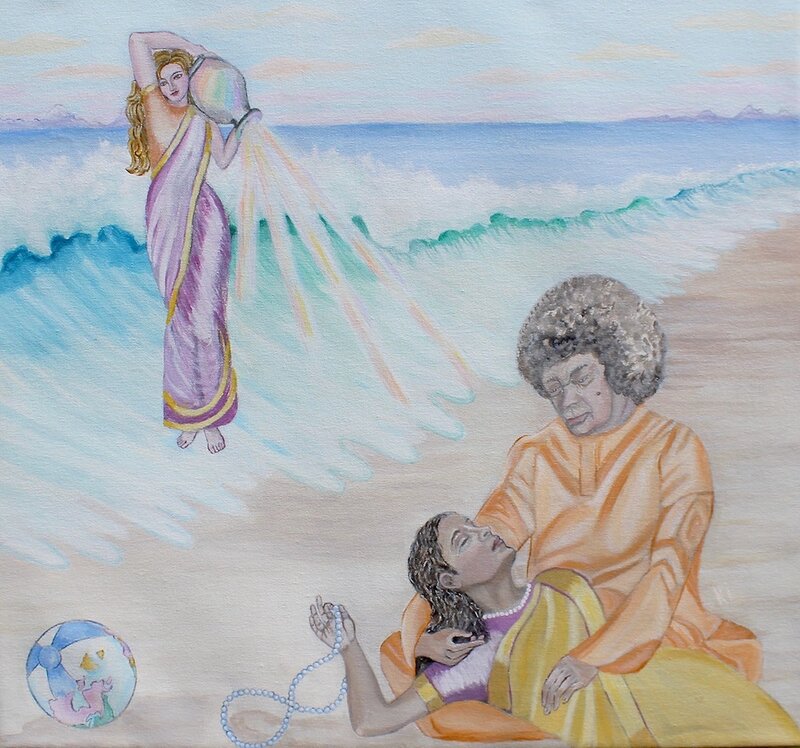 In this painting Sathya Sai Baba rescues me from the Ocean of Samsara. By dedicated sadhana and grace one can realize the Eternal Self. The Goddess Mohini, feminine version of Lord Vishnu is seen in the background pouring the nectar of immortality. In the dream I was in an auditorium of some sort. There were many Sai devotees there. We were all sitting there waiting for some event. I even saw Shanti a devotee from Palm Bay Sai Center walking between the devotees and asking a question which I cannot recall. I remember collecting japa malas from several devotees then getting up and walking outside the auditorium. I saw Sathya Sai Baba standing there and then I saw what looked like a huge, vaporous spiritual outline of Baba's body reclining. I walked inside the body, specifically the heart area. When I got inside, Swami took the japa malas and blessed them inside of His heart. He then returned the malas to me. I left the spiritual body and returned to the auditorium. I told the devotees that Swami had blessed the japa malas inside of His heart and redistributed the malas. The best antidote for all ills. A boat that will take you across the sea of birth and death. Will give you consolation, courage, and the true perspective. The main discipline for this age. Enough to give you all the results of every type of spiritual practice (sadhana). The fountain of primal energy. Will guard and guide you throughout life. The one hope for man; remembrance (smarana), being an inner activity, helps that inner transformation. Will keep the antics of mind under control. It's like moonlight for the waves of the inner ocean in mind. A nearness to God is attainable. The operation of boring in order to tap the underground water. Previous birth effects (prarabdha) will melt away like fog before the Sun. Reliable for a trouble-free journey. The spring of all consciousness (Chaitanya). The thunderbolt that pulverizes a mountain of sin. The unfailing cure for the deadly sin of delusion. Vitamin G, which is required for the nutrition of the mind. Withdraws the mind from the sensory tangle. With a rosary (japamala), turning the beads automatically around, just as mechanically and as punctually and as carefully as any other routine act of daily life. As it ought to be done, repeating the name, regardless of the target number, dwelling deeply on the Form it represents and on the divine attributes connoted by it, tasting it, reveling in it, enjoying the contexts and associations of the Name, relishing its sweetness, lost in its music." Sathya Sai Speaks II, "Believe in Yourself"